Vince Cable has spoken about his mixed race marriage in a moving way. His first wife was Indian and they had a happy marriage by all his accounts till her death from cancer at a young age. Both sets of parents were against the marriage. You can read about it here. It’s a story that is particularly timely and will resonate because this week will see the union of a high-profile mixed race couple, Prince Harry and Meghan Markle. While mixed marriages may be common place the reality is that being in a mixed race relationship is still a difficult one to navigate. There are things that do not occur to you when you are in the happy throes of planning the wedding. Overcoming cultural differences is lost in the mists of the love cloud which instead causes you to labour under the illusion that love will conquer all differences. It doesn’t. Once the years start going by the cultural differences surface in ways that one never anticipated it would. Differing attitudes over how to spend holidays, bringing up the kids and, even, something as mundane as food tastes can cause rifts. Racism is never far away which adds to the strain. Well meaning people will point to your mixed race marriage as evidence that racism could not possibly exist. It takes a lot more than love to keep going in a mixed race relationship. It takes both sides to acknowledge that cultural differences do exist regardless of best intentions and beautiful weddings. It takes both sides to make the time and effort to learn about the nuances of each other’s cultures. Love may be powerful but an understanding and respect borne out of that love is what will keep mixed race couples together in the long term. This may be true of all marriages but my focus here is on mixed race ones. 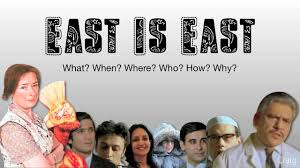 The worst example of a mixed race marriage was depicted in the movie ‘East is East’. Only one culture was allowed to prevail in the family home and this was heavily dictated by misogyny as well. The wife was unable to practice her cultural beliefs out of fear. Why people find this movie funny is a complete mystery to me. By contrast, Prince Harry and Meghan Markle seem to be equipping themselves well for their future together. They have embraced race issues and are keen to be seen to be embracing diversity. There is much adversity against diversity, especially since the Brexit referendum. I wish them well because mixed race relationships are an amazing way of embracing the differences that life gives us. It is a coming together reflective of the societies that we live in. And Vince Cable ought to be more vocal about his personal experience. No other party leader has even a similar experience to speak off.